One advantage to belonging to the Stampin' Up! family, is they treat their demonstrators really well! At the Catalog Premiere last week, not only did we get an advanced copy of the new catalog, we all left with a NEW stamp set! Yep, I have new product already!!! 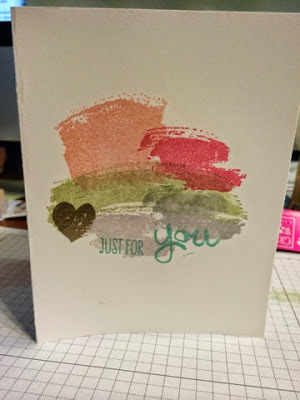 Of course, I don't want to give everything away just yet, so here's a card I made using this new stamp set. It's not the best picture, but you get the general idea! I'll have more sneak peeks coming...so check back often for a glimpse at new product coming June 1! To order your copy of the 2014-15 catalog, simply click here. To attend my new Catalog Launch party June 1, RSVP here.